Many years ago, as a kid, I visited Monticello, Thomas Jefferson's estate near Charlottesville, VA. I was amazed at his creativity and his gadgetry. In the study, there was an awkward machine for creating duplicates of his writings called a polygraph. What impressed me more was a somewhat simpler looking device for perusing up to 5 books or sheets of music at a time. I believe that the stand was placed in the parlor in the 1980's but was later moved to his study. 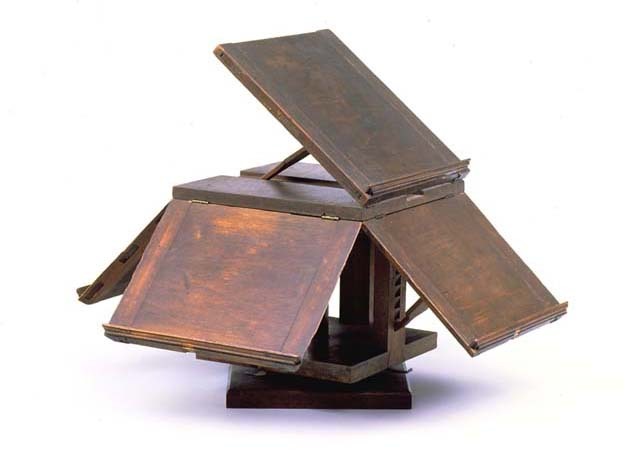 The five sided rotating bookstand, now referred to as the Thomas Jefferson bookstand, could only make me wonder how curious and studious a man Jefferson must have been. I can envision him furiously spinning this thing to cross-reference Palladio, Voltaire, or whatever sundry topic he was researching. Jefferson was a fan of modern technology; and this was probably state of the art. If he were alive today and still had his bookstand, he probably would have substituted a few books for a couple of iPads. 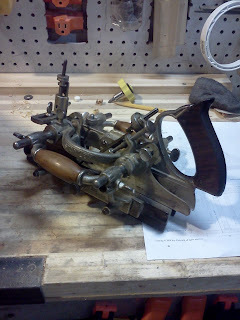 As I was not into woodworking as a kid, I had pretty much forgotten about this device for many years. I had dabbled in woodworking for the last few years, mostly with power tools. 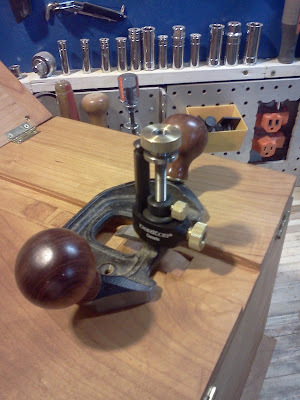 However, it was the discovery of the use of hand tools, particularly hand planes, that piqued my interest in woodworking over the past year. From a safety standpoint, there is probably less risk of a serious injury with hand tools and less concern for dust control. 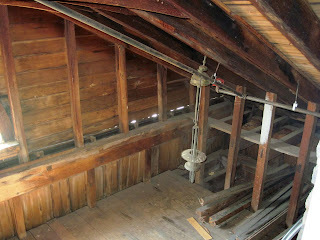 The latter is especially important to me since my shop is only a glorified walk-in closet at 10' x 6' without windows. 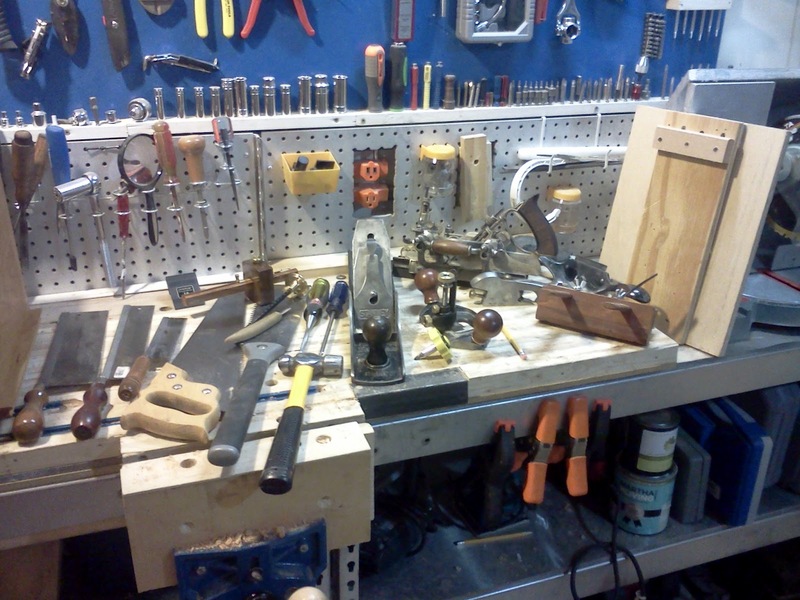 I have to thank Roy Underhill and his show, The Woodwright's Shop, for inspiring me to learn how to better use these tools. The episode that got me hooked was one I found on his website where he explains how to make the Jefferson bookstand. He explained that legend has it that Jefferson likely designed the bookstand. There is not another of it's kind. According to Bob Self (see video from Monticello.org), the Director of Restoration for Monticello, a provenance from Jefferson's grandson, Thomas Jefferson Randolph, confirms that this piece was owned and used by him. 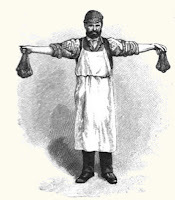 He must have been inspired by André Roubo's tome entitled L'Art du Menuisier, in which there is a description of a folding two-sided music stand with a ratcheting mechanism to allow for angle adjustment. While Jefferson was an amatuer woodworker (Jefferson had his own workshop upstairs at Monticello), many authorities believe that the bookstand was created at Jefferson's joinery shop down the hill and immediately south from Monticello's main house, known as Mulberry Row. "I have never told you of the nice little cuddy that has become my haunt, and from which I am now writing. Do you recollect the place over the parlour's Portico into which the dome room opened? Since the columns to the portico have been completed, Grand-Papa has had the great work bench removed from it, and a floor layed. Corneilia's ingenuity in conjunction with mine formed steps from the dome into this little closet with a pile of boxes, and having furnished this apartment with a sopha to lounge upon, though alas! without cushions, a high and low chair and two small tables, one for my writing desk, the other for my books; and breathing through a broken pane of glass and some wide cracks in the floor; I have taken possession with the dirt daubers, wasps and humble bees; and do not intend to give it up to any thing but the formible rats which have not yet found out this fairy palace." It seems most likely that James Dinsmore and/or his apprentice, John Hemings, the latter who was one of Jefferson's slaves and the half-brother of Sally Hemings, built the bookstand around 1810. John was the primary cabinetmaker and woodworker for Monticello from 1809 through the 1820's. All that remains of John Hemmings joiner shop on Mulberry Row is this chimney. For years, historians believed that this stand was a music stand since there is a hole at the bottom thought to house a tripod. Roy's episode focuses mostly on how to make the panel, which consists of 6 through mortise and tenon joints to create a breadboard clamp. 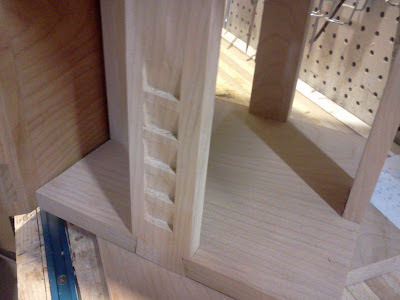 The vertically oriented grain of the end "clamps" of the panel stabilize the main panel's horizontal grain from warping. To further stabilize the wood, the tenons are haunched, meaning that a tongue and groove joint accompanies the mortise and tenons. The vertical ends of each panel are then beveled back to eventually allow the whole contraption to collapse down into a 12" cube. I guess this would allow Jefferson to carry this contraption for travel - the ancestor to the laptop perhaps. Jefferson's bookstand was made of Mahogany. Roy Underhill used walnut in his episode, although it looks like he used cherry for another stand he has displayed in other episodes. 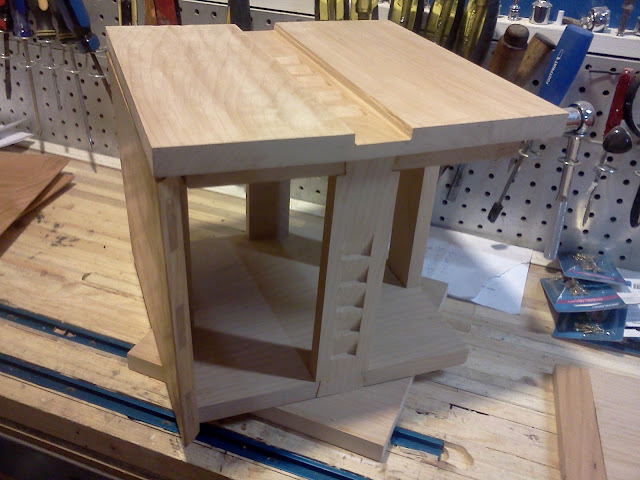 Fortunately, I was able to find the plans for this project on his Woodwright's School website. There is also a piece by David Richards on how to use SketchUp to make the plans which is quite useful. 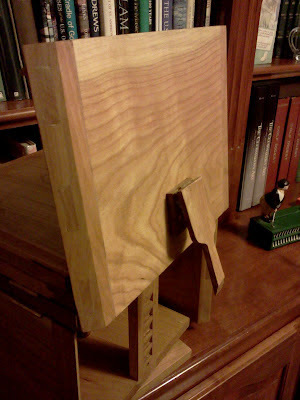 http://www.finewoodworking.com/item/24328/jeffersons-bookstand-another-workflow-example. I decided to use cherry (I had enough darker woods in my study). 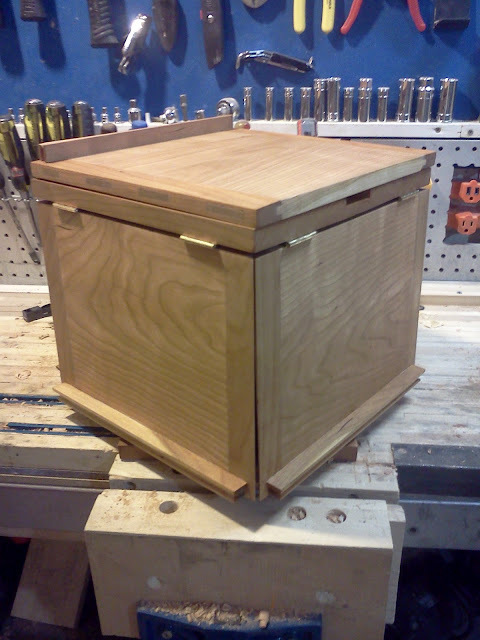 My goal was to create this thing without power tools so that I could improve my hand tool skills. This was really my first project created without power tools. It was a good learning experience and broadened my knowledge of the craft. 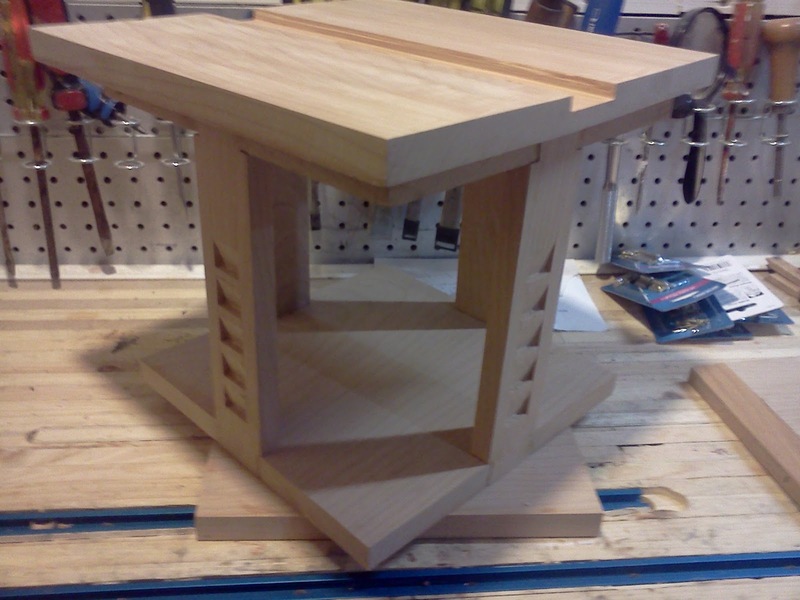 After making the 32 mortise and tenon joints for this project, my skills definitely improved (although my back and novice hands took a temporary toll). Roy's plans call for 1/2" panels. 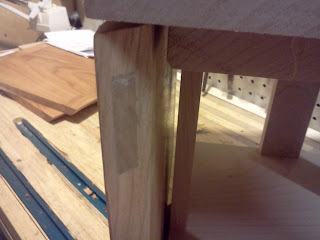 I opted for 5/8" because I was concerned about tear out when creating the 1/4" wide mortises. What can you use this bookstand for? Perhaps, I am not quite the researcher that Jefferson was. But, I do use it to clear up desk space and display books. One slight problem of this design for modern day is that most reference books tend to be larger than 9", which is the approximate usable height of each panel. This can be circumvented by placing the larger books on one of the "rear" panels and opening up the top panel. Another point is that books with decent bindings do not tend to stay open on the page that you want. Therefore, you probably will need weighted bookmarks if you are using this for its actual purpose. If you are interested in making this, first look at The Woodwright's Shop episode on the PBS website. Roy focused primarily on the panel. Then download the plans which you can download from the Woodwright's School website. Some additional tips are below. Folded down unit. Ledges created with one of the complex cutters of the Stanley 55 plane by using a piece of cherry with plenty of room for excess waste. You will waste quite a bit from tear out when going across the grain. Incline the ledge a few degrees from front to back to better grasp the book. Notches allow adjustment of panel to different angles. These were simply marked and chiseled out. The rotating mechanism of Jefferson's original is still a bit of a mystery to me. 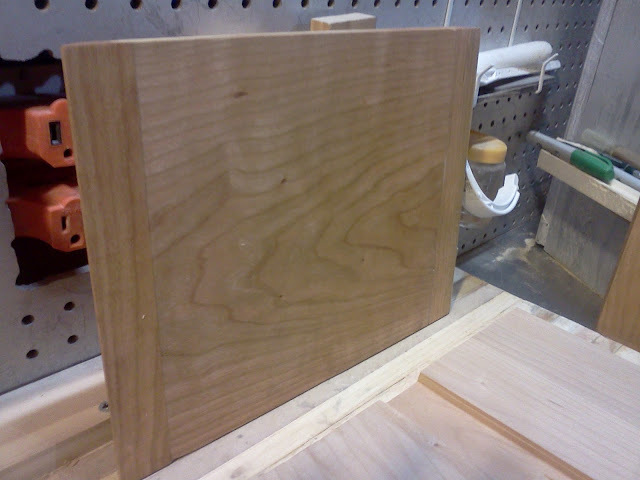 I went the anachronistic route by using a store bought low profile lazy susan embedded between the two bottom boards. I tried it first by having it spin on the top of the rod, but there was too much wobble. Perhaps the original used wood and mutton tallow, just a guess. Nicely aged cherry, a couple of months after completion. For finishing, sand to 600 grit, then use only tung oil (initially with mineral spirits), then a couple more coats of pure tung oil. 0000 steel wool between later coats. A coat of Briwax gave the wood a beautiful brilliancy or chattoyance. Thanks. 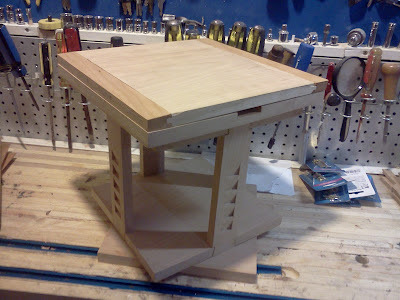 I want to keep woodworking just a hobby. Hello, can you help me locate the plans? The Woodwright's School doesn't seem to have a download area. Thanks! The plans are no longer available from the Woodwright's School or Shop. The SketchUp plans mentioned above look to be the same.